Investment Strategies customized for you and your goals. Create a path for your future with a personalized financial plan. 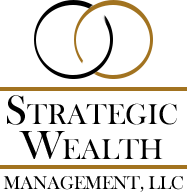 Strategic Wealth Management, LLC is an independent, fee-based financial planning firm offering comprehensive services. We are committed to helping our clients build wealth and reduce the risks to their hard-earned assets. Completely independent, our loyalty belongs exclusively to our clients! We offer a wide range of quality financial and risk management strategies combined with the knowledge and experience of our financial professionals. We serve retirees, those who are corporately employed and the self-employed. In addition, we have experience supporting the broad spectrum of needs for closely held business owners. Customized Strategies: We guide our clients through a one-on-one process to analyze their unique situation, provide education on compatible strategies and work with them to help ensure the plan is effectively implemented. Client-Centered Support: At every inflection point, our client is central to every decision and recommendation. Accessibility, timely responses, as well as a proactive approach to providing our clients with the tools needed to pursue their goals, is what every client can expect. Knowing when you want to retire or when you will be sending your children off to college is only the beginning. We help our clients establish a plan and implementation strategy that brings clarity to what steps should be taken to prepare for these life events. The risks and rewards of owning and running a closely held business is something we know well. Let us show you a path for reducing risks, increase the probability of the outcomes you seek and provide you with time to enjoy the rewards of a successful business. For individuals managing entities in the not-for-profit world, the role as a Fiduciary can be daunting. We serve as a guide through the steps needed to ensure you are taking important factors into consideration when managing assets for the organizations benefit. Our experienced and enthusiastic team thrives on client satisfaction. Please visit our team page to learn more about us.